Does your child have sensitivity to sound or touch? 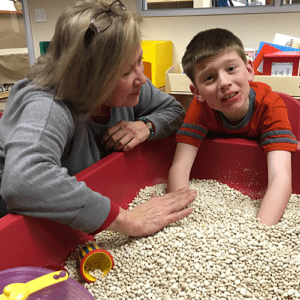 1:1 sensory play may be the answer. Utilizing play activities designed to change how the brain reacts to touch, sound, sight and movement, NBCF will provide weekly, 1 hour sessions, designed to meet your child's unique needs. This program is perfect for children who also have physical and/or intellectual disabilities in addition to their vision issues. For more information or to schedule a consultation, contact the Learning Center at 702-735-6223. 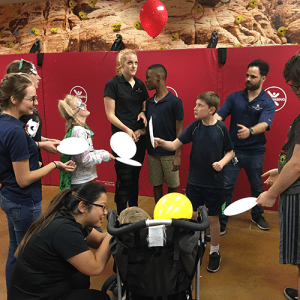 Sensory playgroups are developed and implemented by therapy students from Touro University, under the instruction of a licensed therapist/instructor. As a partner program with Touro University, this program fulfills one of the final graduation requirements for therapy students, while giving NBCF students and their parents additional sensory/therapy education and programming at no cost. Dates have not been determined yet for the 2018-2019 school year... please check back for dates or contact the Learning Center at 702-735-6223, to be put on a list and contacted when registration opens.